I used to be a doctor. Scratch that. I am a doctor, but I am not currently licensed to practice in the United States. Before I came here, I had a medical practice in my home country: Libya. Now, I am a graduate student studying global public health at St. Kate’s, and I have an internship at WellShare International. 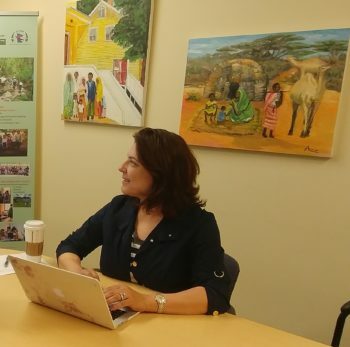 According to their website, “WellShare partners with communities and health care providers to design, implement, and evaluate health programs that respond to the needs of each population we serve.” WellShare’s work spans from Minnesota to East Africa. Although both my work as a doctor and at WellShare has some overlap (namely, they both support health), they also have some huge differences. After several months of working at WellShare, here are the top 5 differences I have noticed between practicing medicine and practicing public health. 1. One person vs. 100. In my medical practice, I would treat 1 patient at a time. I would listen more than I talked. I spent 15-30 minutes with each patient and addressed his or her presenting problem specifically. In my public health internship, I am currently working on educational materials for community health workers as well as clients; our goal is to reach the broader community of hundreds or even thousands of people. In creating the educational materials, I am doing all the talking. I (or, really, WellShare) decide what the health problems of interest are based on their daily interactions with underserved populations. I don’t spend time with any individual patients and instead try to address problems that may affect many people by sharing broadly applicable information. 2. Treating with prescriptions vs. treating with prevention and education. In medicine, our tools are prescriptions and therapies. Medical providers provide treatments and a small amount of advice so that the patient can understand their condition and get well. In public health, our tools are prevention and education. The education needs to be specific, evidence-based, accurate AND simple enough that a non-medical professional can understand it. Education was a very small part of my patient interactions when I was a doctor, but it is the focus of the work I am supporting at WellShare. I have found it challenging to translate what I have learned and practiced about various health problems into words that fit into one document that are understandable to everyone. It has been helpful to talk to my preceptor and medical advisor at WellShare about what words and concepts are common knowledge and which are not. 4. Specialization vs. diversification. As a medical provider, I focused on just one field: dermatology (skin disease and skin manifestation of internal diseases). I studied, trained, and worked within the bounds of that one area for 13 years before I came to the United States. At WellShare, the educational materials I am working on span 15 topics. These topics include: Diabetes, Prediabetes, screening of breast, colon, and cervical cancer, mental health, honouring life, etc. The most interesting part for me is when my specialized experience intersects with the diverse range of public health topics. At WellShare, I especially enjoy working on topics that are receiving a lot of attention in public health and are relevant to dermatology, such as STDs, diabetes, anxiety, and breast cancer. 5. Practice vs. policy. When someone walked into my office seeking my help, my perspective was narrowed to the domain of the human body. The body may be a complex system, but it has clear bounds and (to me, at least) felt simpler than all of things that are important to keep in mind with public health. At WellShare, as is true with all public and global health practices, we always keep in mind health policy. Policy shapes what we do and how we do it. We are also always thinking about justice in every action. Justice is the core. For example, at WellShare, we have to think about how to reach everyone equally, how to improve access to health resources, and make sure to include community members in decision-making about how we do our work. By comparison, a mole removal procedure feels much simpler! My biggest take away from my experiences as a doctor and my time at WellShare is that we live to serve people who need us; medicine and public health are complementary. The broad view of public health can improve the comparatively narrow treatment of disease in a medical office and vice versa. Before my experiences at St. Kate’s and WellShare, I had not really been pushed to think about how issues like environment, equity, and racism impact health. Someday, I hope to practice medicine with an international organization, and I already know I will be a better doctor, a better leader, and a better practitioner with the perspectives I gained on public health through my work at St. Kate’s and at WellShare International.